Samsung may be best known for its Galaxy smartphones, but its smartwatches are no less worthy of attention. 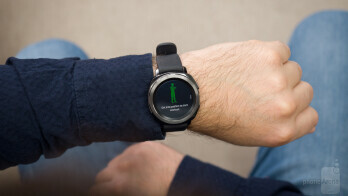 Whether you’re an active individual in need of a fitness companion or a tech-savvy person who finds classic watches lacking in function, chances are the company’s Gear lineup has something that just might suit you. Something like the Samsung Gear Sport, for instance. It is the latest member in the series, and I spent a couple of weeks in its company to find out whether it is worth the $300 asking price. Let’s dive in. The Samsung Gear Sport shares a lot of design DNA with the Gear S3 and the Gear S2. Said briefly, it is a stylish piece of kit. The black version you see here is minimalist in nature and doesn’t draw attention, but there’s also a flashier blue model designed to stand out. 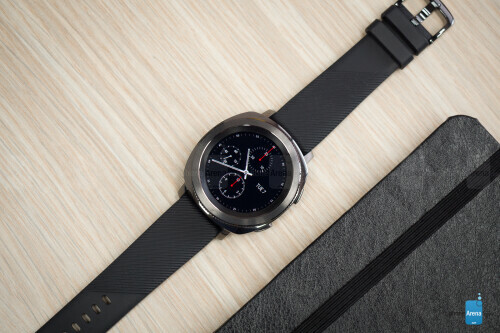 Built of metal and glass, with a plastic bottom, the watch is big enough to be comfortable to use and to accommodate a reasonably sized battery, but lacks the chunkiness and the rugged appearance of the Gear S3 Frontier. And I’d say it suits me well, whether I’m exercising in my sporty jacket or just going about my day in my office-friendly shirt. Unfortunately, I can’t recommend the Gear Sport to ladies – it is simply too big to look good on a woman’s wrist. Out of the box, the Gear Sport comes with a stretchy rubber strap that is comfy and grippy, held by a classic and reliable metal clasp at the end. 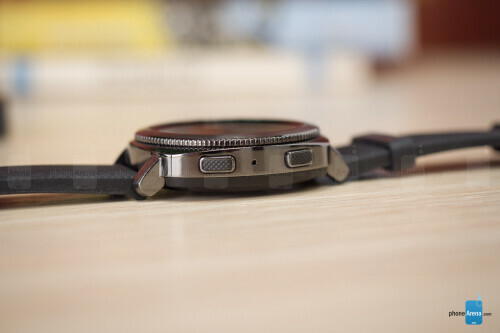 The strap is removable, and a traditional 20mm band can fit in its place. You might end up replacing yours sooner or later because the stock one on mine is already showing signs of wear around the edges. 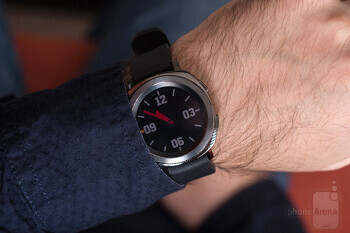 The circular bezel around the display is as effective as usual: it is used to browse through the interface, and each twist is accompanied by a nice, easy-to-feel click. 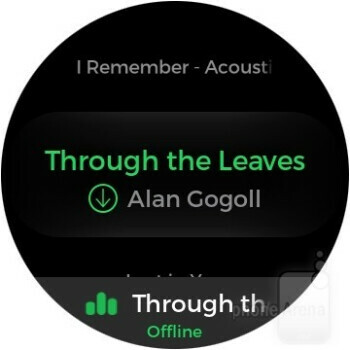 On the side are two buttons – one that takes you back a step and one that takes you back to your watchface. 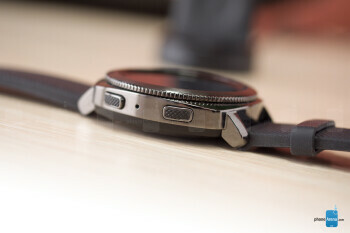 Water resistance is present on the Gear Sport. In fact, the gizmo is resistant down to 50 meters and can be worn during swimming exercises. Even salt water shouldn’t do it any harm, although rinsing it with fresh water after going for a dip in the ocean is pretty much mandatory. 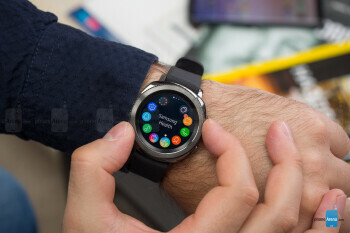 The Samsung Gear Sport comes with a 1.2-inch circular AMOLED touchscreen display – larger than the one on a 38mm Apple Watch, yet a tad smaller than the one on a Gear S3 Frontier. 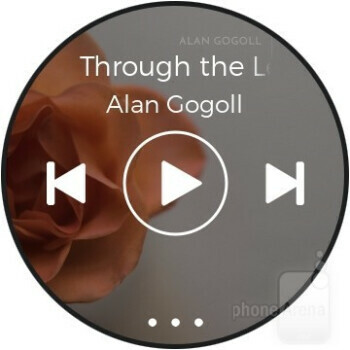 It has a resolution of 360 by 360 pixels and is protected by Gorilla Glass 3 scratch-resistant glass. Technicalities aside, the screen on the Gear Sport is pretty great. It is bright enough to be perfectly legible on a sunny day, but it won’t burn your retinas at night since it gets dimmer automatically when appropriate. Colors are vivid, graphics are sharp, and text is easy to read, and there’s the neat, full-color Always-on Display option, letting you leave the display lit at all times. Unsurprisingly, touch sensitivity suffers when the screen is wet, but it can tolerate sweaty fingers in most cases. 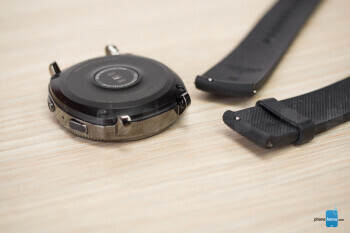 The rotating bezel and side buttons ease navigation in such circumstances, and a Water Lock mode is available to disable touchscreen input entirely during swimming exercises. Throughout my testing, I used the Samsung Gear Sport together with a Galaxy Note 8. Pairing was simple and effortless: as soon as I powered the smartwatch, the phone automatically detected its presence, and a tap later the process was underway. The Gear Sport is also compatible with non-Samsung Android devices, as well as with newer iPhones, though as expected, you’ll have the smoothest experience if you’re a Galaxy user. Overall, using the Gear Sport is a fun and smooth experience. 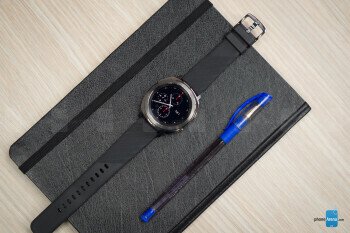 The watch is fast and responsive, just like the Gear S2 and S3 before it, while the Tizen 3.0 is designed from the ground up to work seamlessly with the circular display and rotating bezel. No common action feels like it is requiring too many steps to perform. 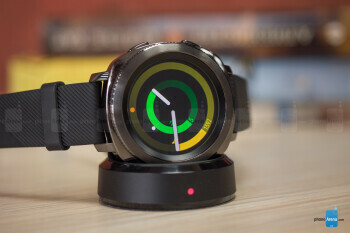 As far as navigation and layout go, the software on the Gear Sport isn’t much different than what you’d find on a Gear S3 or a Gear S2. 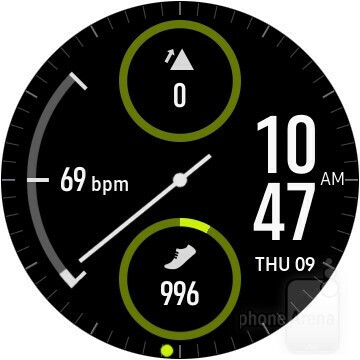 The watch wakes up automatically when you look at it, displaying the watchface of your choice. Admittedly, this gesture is not guaranteed to work every time, but failures are rare. Then you use the bezel to access widgets or your pending notifications. Swiping down displays a screen with status information and quick toggles for various settings. 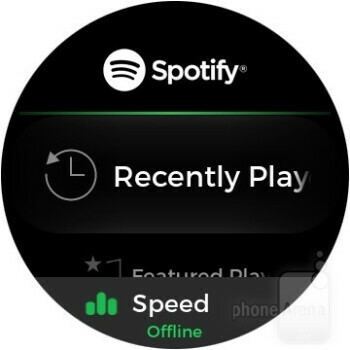 Something that is new is the added support for Spotify listening plus the option to store tracks offline – on the watch itself. Basically, this allows you to leave your _phone_ behind and pair a Bluetooth headset directly to the Gear Sport whenever you want to listen to music while exercising. So that’s what we did, and it worked like a charm, with no connection interruptions occurring during our testing. The 40 songs that I saved took up roughly 150MB, meaning that around 500 tracks could fit on the watch’s internal memory (4GB total, ~2GB user-available). Alas, the Gear Sport is not without its imperfections. For instance, vibration feedback could have been more pronounced. It was more than once when I didn’t feel the watch pulse after receiving a notification. Voice commands still feel slow, and on several occasions answers didn’t arrive at all. The selection of apps has been growing, but still feels limited compared to what the Apple Watch and Android Wear have to offer. None of these flaws are dealbreakers, we’d say, but there’s definitely room for improvement. If there’s one thing a smartwatch with the word “Sport” in its name should excel in, that would be activity and exercise tracking. In this respect, the Samsung Gear Sport holds plenty of potential, equipped with a range of sensors, such as a heart rate monitor, an alitmeter and barometer, and a GPS radio for location tracking. Plus, the 5ATM water resistance makes it perfectly safe for tracking of swimming exercises. 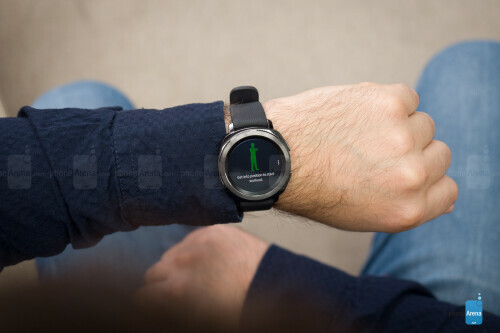 By default, the Gear Sport is set to track activity automatically, so when it detects that you’ve been walking intensely for some time, this will be recorded and stored as exercise. But of course, you can start a workout manually by choosing an exercise preset: running, cycling, swimming, crunches, jumping jacks, to name a few. In these situations, the Gear Sport performs well, presenting a detailed log of your exercise once you’re done. But ironically, the watch isn’t great at tracking sports like soccer or football, presumably because there aren’t presets for those. 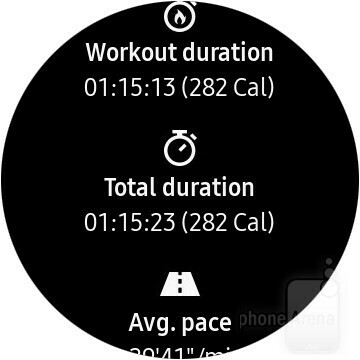 Using the “Running” preset instead returns wildly inaccurate data while picking the “Other Workout” preset or letting the watch automatically detect the exercise logs very little information. 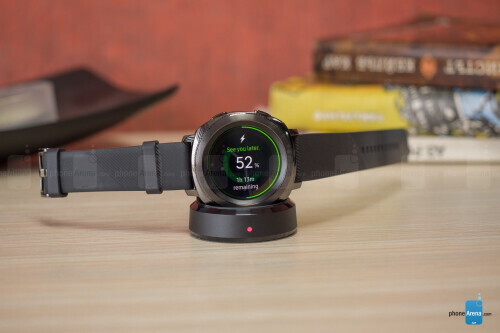 While the Samsung Gear Sport connects to a smartphone via Bluetooth, it also has its own Wi-Fi radio, and if it gets outside of your phone’s range, it will attempt connecting to a Wi-Fi network so that you still get your notifications. It is cool how Wi-Fi network passwords stored on my Note 8 were automatically copied on the smartwatch as well. Samsung Pay is enabled on the wearable, but while it works on contactless payment terminals, there’s no support for ones using the old-school magnetic strip technology. 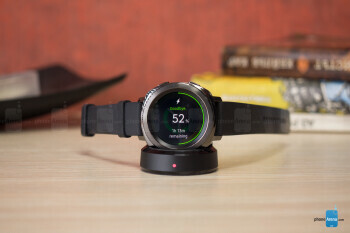 There’s no LTE or any other cellular connectivity support on the Gear Sport. Since there’s no speakerphone on it, you can’t use it to make or take _phone_ calls, although you have the option to pick up or to reject an incoming one. As the case is with most gadgets, the battery life of the Samsung Gear Sport depends greatly on how it is used. By default, the always-on display mode is disabled, and the screen brightness is set to a perfectly adequate 7 out of 10 – a configuration that easily got me through 3 full days of use, but without using GPS services and without listening to any music through it. With mixed use, a 2-day battery life is to be expected. To put these results into context, the Apple Watch Series 3 and the Android Wear-powered Huawei Watch 2 last no more than two days between charges if used lightly. If you prefer the convenience of AOD, you’ll be recharging your Gear Sport pretty much every night. 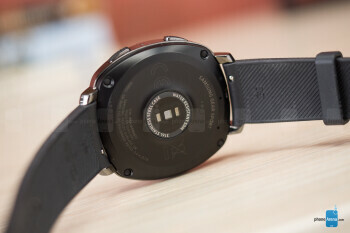 Listening to music stored on the watch consumes an additional 15% of battery per hour. Using GPS services during activity tracking also consumes about 15% of charge hourly. Recharging the Gear Sport on its wireless charging stand takes 2 and a half hours, which isn’t fast. Just to see what would happen, we tried placing the watch on a Samsung wireless charging stand, but no power would flow between the two. There are many things to like about the Samsung Gear Sport. It is good-looking, it is fast and responsive, it has a great display, it lasts sufficiently long between charges, and it is durable enough to withstand some seriously wet exercises. On top of this, the addition of Spotify with offline listening support is more than welcome. But as I mentioned earlier, there’s still room for improvement. Most notably, while the Gear Sport could be a handy companion at the gym, in the pool, or during a morning jog, it isn’t all that great at tracking actual sports. I’m not sure why that is when the Android Wear-based watch I was using before it was perfectly capable of this. But at the end of the day, if you’re in the market for a smartwatch, the Samsung Gear Sport should be on your shortlist. While it may not be perfect in some areas, it excels in others, so even at $300, it is an option worth considering.